The locker room was getting crazy crowded. Beaming team officials milled about. Equipment guys hurried to pack and get out of the way. Reporters and television cameras were everywhere. The whole scene was a little too much for center Rodney Hudson. He wanted to bounce. After balling out again in the sizzling Oakland Raiders’ most recent victory last week over the Buffalo Bills, Hudson had earned the right to shut it down. Clearly, left tackle Donald Penn didn’t care. As Penn opened up about being the anchor of the NFL’s only all-black starting offensive line, he dragged Hudson into the interview, too. In the O-line’s corner of the room, over the din of intensifying background chatter, Penn playfully went in on his dude, strongly encouraging Hudson to also share his feelings about the unit that has brought back the swagger to the Silver and Black. Properly motivated, Hudson agreed to remain on the clock a bit longer. Behind arguably the league’s baddest – and without question, the blackest – O-line, the Raiders are no longer a hot mess. With four weeks remaining in the regular season, an organization synonymous with failure for most of this century is assured of having its first winning record in 14 seasons. The franchise’s renaissance, however, could wind up being so much more. 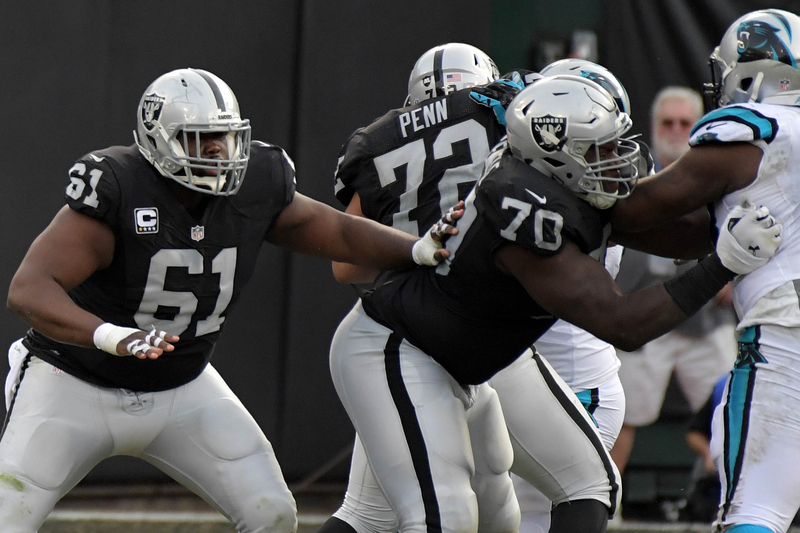 Oakland’s bedrock O-line – Penn, Hudson, left guard Kelechi Osemele, right guard Gabe Jackson and right tackle Austin Howard – is the foundation of a first-place team. Third-year quarterback Derek Carr is looking every bit like an NFL MVP. And don’t be surprised if the road to the Super Bowl in the AFC winds up going through Oaktown. The Raiders are counting on it. Even with a defense that won’t remind anyone of the 1985 Chicago Bears (Oakland is less dope on the other side of the ball, to say the least), the Raiders could end the season holding their fourth Vince Lombardi Trophy. Their O-line is just that sick. Penn’s crew will get many more opportunities to prove it. Beginning with Thursday night’s road game against AFC West rival Kansas City Chiefs, Oakland, which hasn’t had many meaningful late-season matchups in a minute, faces a closing stretch that will show just how far it has come. At both 10-2, the Raiders and New England Patriots are tied for the AFC’s best record. In the West, the Raiders are only a game ahead of the Chiefs. The conference’s top seeding is still up for grabs. The grind doesn’t stop. Fortunately for the Raiders, they’ve got the right brothers bulldozing their path. You can tell so much about people by what they hang on the walls of their homes. Artwork, pictures, notable quotes – it all provides a window into what’s most important to them. In the NFL, a position group’s meeting room is its “home” at team headquarters. At the Raiders’ complex in Alameda, California, the offensive line celebrates black pioneers. The Tuskegee Airmen are featured prominently in signs, Penn said. The World War II heroes from Tuskegee University exemplified bravery and excellence during an era in which most of those in power believed black people were incapable of displaying either. There’s also a nod to the 1965-66 Texas Western men’s basketball team, Hudson revealed. That squad (the school has since changed its name to the University of Texas at El Paso) became the first to win the Division I championship with an all-black starting lineup. Nowadays, a top-notch hoops starting five in college or NBA that isn’t all-black is the outlier. Oakland Raiders quarterback Derek Carr (No. 4) throws as center Rodney Hudson (No. 61) and offensive guard Kelechi Osemele (No. 70) block against the Carolina Panthers during the second half at Oakland-Alameda County Coliseum. The NFL is almost 70 percent black. Among tackles and guards, though, there’s much more diversity. At those spots, African-Americans only slightly outnumber whites. Whites, however, overwhelmingly hold it down at center: They occupy more than 80 percent of the positions. What’s up with that? Sociologist Harry Edwards, who has spent decades observing the NFL, has some ideas. “It’s not that NFL teams sit there and say, ‘Oh, my God, he’s black. We don’t want him as a center,’ ” Edwards told The Undefeated recently. “What happens is, teams see a white center coming out of Wisconsin or coming out of Ohio State or coming out of Stanford, and say, ‘Hey, that guy can call at this level.’ It’s not that they’re excluding anybody. The Raiders didn’t plan to assemble a soul squad along the line. It just happened in the process of fixing something that had been broken for years. Problems along the O-line were as much a part of the Raiders’ recent bleak history as the revolving door in the head coach’s office. The once-dominant Raiders – during an eight-year stretch from 1976-83, they went 80-37 with three Super Bowl championships – had become a punchline. After he was hired in 2012, Reggie McKenzie, only one of seven African-American general managers in the 32-team league, set out to end the jokes. Over the past three years, no team builder has invested more than McKenzie in assembling a successful offensive line. The Raiders have the cap numbers to prove it. Jackson was part of McKenzie’s lit 2014 draft, which was topped by superstar defensive end/linebacker Khalil Mack – with all due respect to Denver’s Von Miller, no defensive player in the second half of the season has been more dominant than Mack – and also included the steal of the class: franchise quarterback Carr. To fill out the rest of the line, McKenzie put in work in free agency. Before signing with the Raiders in 2014, Penn, in his 11th season the old head of the crew, played for Minnesota and Tampa Bay. He re-signed with Oakland in the offseason. Hudson left Kansas City for Oakland. Baltimore, which rarely makes glaring player-personnel mistakes, somehow let the uber-talented Osemele get away. Before landing with the Raiders in 2014, Howard spent time with three other teams. In particular, Hudson and Osemele have been high-impact additions. They were super in Oakland’s stunning 38-24 come-from-behind victory in Week 13 at the Oakland Coliseum. Trailing, 24-9, in the third quarter, the Raiders scored 29 unanswered points in their sixth consecutive win. Impressive on film, Hudson and Osemele are even better in person. Those teams have game’s best O-lines, astute observers of NFL line play say. Which one is No. 1? For the past few years, the Cowboys were considered way ahead of the pack. Now, with how the Raiders run the ball and protect Carr so well, there’s suddenly room for debate. The Cowboys have had as much success picking linemen in the draft as the Raiders have had in free agency. Oakland Raiders quarterback Derek Carr (No. 4) stands in the team huddle against the Buffalo Bills in the second quarter at Oakland Coliseum. With the 16th pick in the 2014 draft, Dallas selected Zack Martin, who played left tackle at Notre Dame, but was taken with guard in mind. They added Martin after taking left tackle Tyron Smith ninth in 2011 and center Travis Frederick with the next-to-last pick in the opening round in 2013. At 11-1, Dallas has the NFL’s best record. The Cowboys rank among the top five in the league in total yards per game, rushing yards per game and points per game. The Raiders rank ahead of the Cowboys in passing yards per game and points per game. You get the idea: Both O-lines are loaded with ballers. “From an addition standpoint with free agency, the Raiders have done a great job with what they’re trying to accomplish, just as far as being able to play ‘bully’ football,” said Schlereth, who played guard in the NFL for 12 years and was on three Super Bowl winners. “In this day and age, where everybody wants to spread you and throw the ball, to be able to condense formations and essentially beat you up at the line of scrimmage gives you dual-threat ability. Some would tend to give Cowboys’ O-line the edge over the Raiders because they seem to run the ball better (the Raiders are seventh in rushing yards per game). Not so fast, Schlereth says. There’s no doubt that the Cowboys are the gold standard in the running game. But the Raiders match up well on the ground with any top 10 team. With the running game, it’s not necessarily about total yards. When you run the ball successfully is just as important as what shows up on that stat sheet. “Just because a team averages 136 yards or whatever running the ball, a lot of people will say, ‘Hey. This team is great at running the ball.’ Then you go and look at the film, and 70 yards are ‘empty yards,’ ” Schlereth said. “On third down and 19, yeah, we popped a 12-yard draw. And we did that three times. And we never converted a first down. We’re going to talk about how well we run the ball? Don’t mess with Carr. If you do, you’ll have to answer to his dudes. 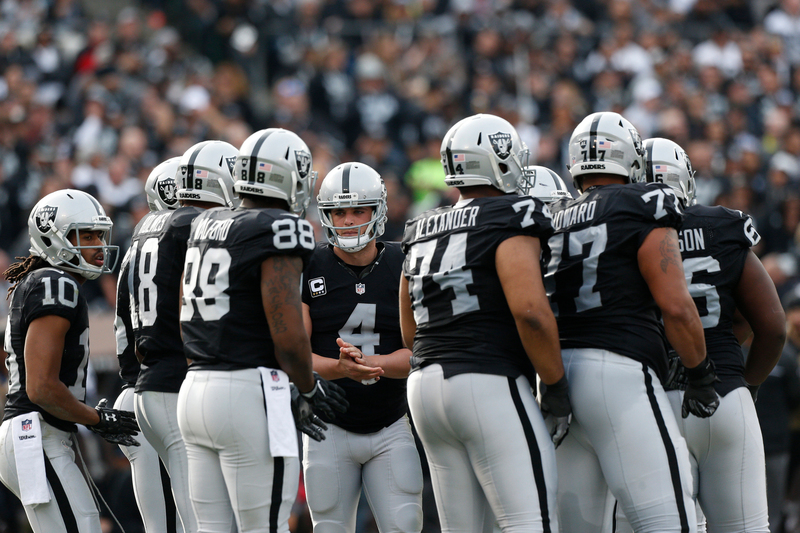 The Raiders’ O-line is fiercely protective of the young superstar. It shows in Carr’s clean uniform. The Raiders have given up only 13 sacks – the fewest in the NFL. They’re second in pressure percentage, which takes into account a passer’s percentage of dropbacks in which he is sacked, under duress or hit, according to ESPN Stats & Information. Those numbers have helped Carr achieve these: 3,375 passing yards, a 65.5 completion percentage and 24 touchdowns with only five interceptions. Also, Carr this season has emerged as one of the game’s best closers. You can’t discount the safety he feels in his rise to the top. The Raiders’ O-line has every right to be proud about that. From watching Oakland’s O-line, you get the feeling that that’s a goal definitely within its reach. The group would have to break a whole lot of new ground for black folk along the way. Of course, that is exactly what it has been doing each week.